Walker Meadows ground round is available at our Farm Store. A variety of cuts is available through Kitsap Fresh. Cattle are a key part of Abundantly Green’s diversified farm near Keyport and Brownsville. As part of being a sustainable farm. Marilyn's cousin Paul has taken over the cattle. He sells meat under the name Walker Meadows, in honor of their mutual ancestor. We had kept Marilyn’s father’s herd of cattle, and the current herd is descended from them, with some genetic diversity. Paul is keeping this a Hereford herd. They are the source for much of our composted fertilizer. We pasture them using the sustainable practice of rotational grazing. Our beef never eat hormones, steroids, antibiotics or soy. The meat is lean, smells and tastes like beef used to taste (and still does in some parts of the world), and is healthy for you. We have chosen not to certify our beef organic because the cost of importing certified organic hay into Kitsap County would price our beef beyond the reach of most people. 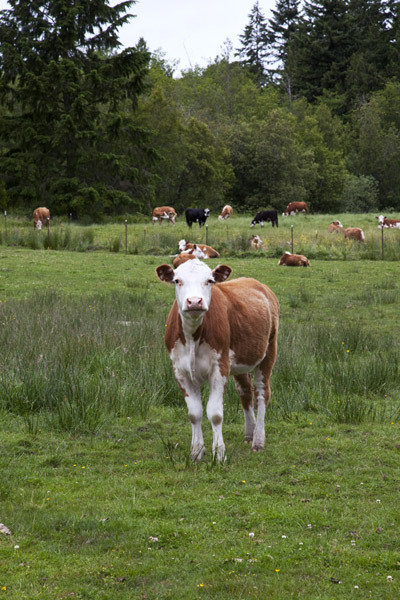 Most certified organic beef operations can raise enough feed for their own animals. We cannot. Our herd grazes on our certified organic pastures, eats local hay that is naturally raised but not certified organic, and in winter eat alfafa. Just so that you know, we are committed to the health and well being of our animals as well as committed to your health and well being. Because our farm is on bottom soil, they are vaccinated and wormed. They do not receive medications, steroids, and such in their food. We follow all guidelines for any medications we may use. Happily, most of our animals are never medicated. Our philosophy is that these animals live and die so that we can live better, so we treat them very well because of their place in our lives. ©2018 Wind Holt & Company, LLC. Abundantly Green is a registered trademark of Wind Holt & Company, LLC.